Elegant Themes Coupon Code 2019 ~ Real Yearly & Lifetime Discount! Which Elegant Themes Package Do You Need? 1 Which Elegant Themes Package Do You Need? 2 Why Should You Choose Elegant Themes? Elegant Themes offers three great value packages for web masters of all levels: Personal, Developer, and Lifetime Access. Personal offers access to all available themes with updates and premium technical support, for $69 a year. Developer offers access to all available themes with updates and premium technical support, along with all Elegant Themes plugins and layered Photoshop files for you to use to make your own modifications to the themes. All this for only $89 a year, or use our special promo link to get the Developer package for only $70. Lifetime offers all the benefits of the Developer package for life – yes, for life – plus no yearly fees, all for just $249. 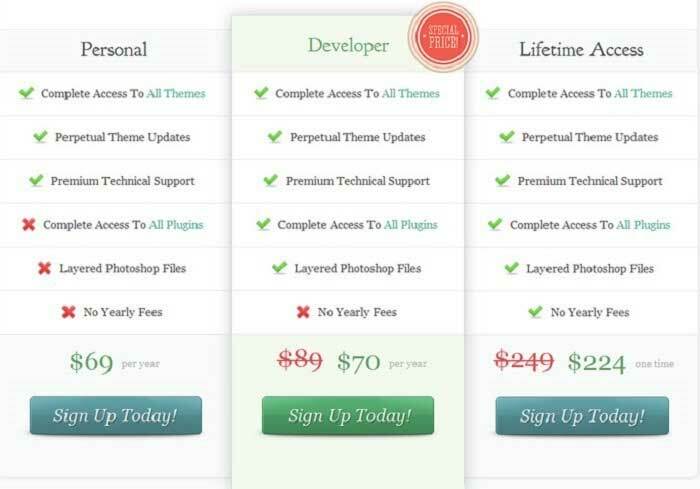 Or use our special promo link to get lifetime access to all the themes and plugins for only $224. Whether you have a personal blog or are in charge of the website for a multinational corporation, all web masters have one dilemma in common: Finding the perfect theme. The right theme really makes all the difference to your website. A good theme helps you to look professional and gives a great first impression. Unfortunately, finding a good theme for your website can seem a bit like looking for a needle in haystack. Some themes look great, but cost a fortune. Others might look great, but try to install and use them and you might end up feeling like you need a degree in coding just to get your website looking right. Elegant Themes founder and CEO Nick Roach certainly understands why top notch design matters. Elegant Themes started as a one man operation in his college apartment. Now, eight years on, Elegant Themes boasts 33 team members and over 260,000 customers. Throughout their success, the Elegant Themes team has stuck with the principles that inspired Nick eight years ago – simply beautiful design that works. We happen to think that if you’re looking for the right theme for your website, Elegant Themes is absolutely worth checking out. You’ll have access to a wide range of themes that are designed to be quick and easy to use whilst still offering a high degree of functionality. Elegant Themes is a good choice if you want your website to be personalized and unique to your brand, whilst enjoying plenty of options to make sure your theme is as powerful as it is beautiful. We hope you’ll find our Elegant Themes review useful. Let’s take a closer look at Elegant Themes and see how they do in four important categories. Elegant Themes offers great value for money, offering three packages, all of which give you access to all 87 themes (and counting) with updates and technical support. It’s good to know that with Elegant Themes you’re getting the same great themes and service regardless of which level package you choose. If you subscribe to the Personal package, you get all the themes for $69 a year. When you consider that you can use as many of them as you like on as many domains as you like, that’s a bargain! Even if you only use one or two themes, the themes you download are yours to keep for life even if you don’t renew your membership, meaning you can get a beautifully functional theme for your website for a fairly small investment. If you want a bit more functionality, the Developer packager delivers. As well as all themes and updates, you’ll get access to layered PSD files so you can modify all the imagery to your heart’s content, plus you can download Elegant Themes exclusive plugins. This package costs $89 a year. Elegant Themes also offers the option of a one time payment of $249, giving you Developer-level access to all themes and all future themes for life. For serious web developers, that’s a lot of themes for your money. Divi is a highly customizable theme with seemingly limitless options and a unique page builder designed to make it easy to build your Divi theme your way. Divi features a stable of modules that can be added to your site in any configuration, allowing you to build complex sites that are still user friendly and easy to navigate for your visitors. Explorable is a map-based theme perfect for travel blogs, with links to Google Maps to make it easy for visitors to see where you’ve been and where you’re going. A unique star rating system means visitors can add their thoughts, making the theme useful not only for travel blogs but exploring different locations, shop branches, restaurants – the sky’s the limit! Nimble is designed to be bold and noticeable, yet still understated enough to let your content speak for itself. Nimble displays beautifully from the biggest screen to the smallest handheld device, truly earning its name. These three popular themes are just a taste of what you’ll get on Elegant Themes – every one of the 87 themes available at Elegant Themes is designed with attention to detail for both style and functionality. Browsing the themes to find one you want is easy – you can narrow it down by category, then click on each theme for a helpful write up of its main features and a handy preview function that lets you try out each theme on your site quickly and easily. Are you looking for elegant and functional WordPress themes for your website? Then you’ve arrived in the right place! Elegant Themes offers a selection of 87 beautiful professionally designed themes that will make your business or personal website stand out from the competition. Elegant Themes gives you access to a range of themes and plugins that have been beautifully designed by people who are passionate about great looking websites. Your website is your space on the internet, your store front if you run a business, your front porch if you run a personal website. A website that looks good and is easy to navigate gives a positive first impression, which means visitors are more likely to stay on your site. Elegant Themes are designed to work with WordPress, one of the most popular, powerful, and user-friendly web building platforms. Elegant Themes will make your WordPress-built site look professional and friendly, and if you’re not completely delighted you can take advantage of their 30-day money back guarantee. Monarch Social Sharing to help you get more “likes” for your site. HandHeld to help you build a mobile friendly version of your site easily. Elegant Page Builder to create advanced layouts for any post or page. Maintenance Mode to create a “coming soon” notice while your site is being built – and encourage visitors to keep in touch via social media and email. Elegant Short-codes so you can use Elegant Themes’ useful short codes with any theme, even if you didn’t buy it from the site. Elegant Themes are designed to be easy to configure and use, for themes that don’t only look good, but help your website to be the best it can be. Elegant Themes are coded to be responsive, meaning you can rest assured that your website will look good no matter how or where it’s viewed – definitely a plus point as a site that doesn’t display properly will frighten visitors away! Once you’ve downloaded your theme of choice, you’ll find you have tons of options to play with so you can get your theme set up the way you want it. The ePanel gives you all the options you need to manage your theme, including color and layout options, SEO, ad management and navigation. You’ll find absolutely everything you need to build a fully functioning website. Security is one of the main concerns when it comes to the reliability of an online business. Some individuals try to take control of your website by injecting malware, spamming and by other hacking means. As an Elegant Theme user, you do not have to worry about the security of your WordPress website anymore. Since by selecting Elegant Themes for your site, you’re choosing a theme built on a highly secured framework. The ePanel is automatically integrated with WordPress, which means it will appear when you download your theme. This is a handy feature – getting into your theme and making changes is quick and easy with no need to fiddle with code or hunt all over the place for the settings you want. Having a beautiful theme is wonderful, but what if something doesn’t work? Luckily Elegant Themes offers a dedicated support system to make sure you can get the help you need if that one sticky little thing just won’t work for you, or you can’t get that perfect theme working the way you want it to. Elegant Themes offers extensive support documentation, so there’s plenty of info available to help you trouble shoot. If that’s not quite cutting it, members also have access to the Elegant Themes support area, a friendly and helpful forum where you can ask for the help you need, and get responses from Elegant Themes’ knowledgeable staff. The forums are divided by type of theme, making it easy for you to find the help you need. We’re particularly impressed with the fact that Elegant Themes offers the same premium support to all customers, regardless of which package they buy, so you don’t have to buy a better package to get the best support. So, what’s our overall take on Elegant Themes? Pretty good, actually! Elegant Themes offers excellent quality themes with a bevy of customization options, at a very reasonable price. If for any reason you don’t love Elegant Themes, they offer a full refund policy for the first 30 days, which is as easy as sending an email, meaning you can try out their themes for yourself, risk free. If you’re looking to get your site looking its best, we recommend Elegant Themes. Elegant Themes are easy to use and you can modify them, use them for your clients, and use them for as many websites as you like. Add in the excellent support community and it’s clear that Elegant Themes provides an easy to use solution to help you build a beautiful website starting today. Considering the excellent quality of many themes as well as their affordable price, the overall rating for Elegant Themes is highly recommended and excellent for both business and personal sites. Their package suits those who’ve numerous websites since you can select from a variety of unique and professionally-made themes. For those who’re planning to use their themes for the websites of their clients, Elegant Themes are also recommended because you can use these themes on an unlimited number of client or personal sites plus have such a broad variety at your disposal.